This was part of my last years reading list and it’s very naughty of me to have only just finished reading it! 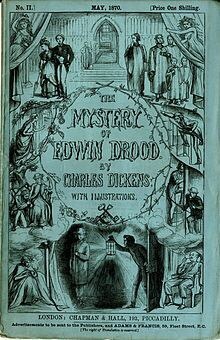 The final, incomplete and posthumous work of the famous author it was about half complete at the time of Dickens death and much speculation about the ending has amused generations. The book tells the story of a young couple whose fathers willed that they should marry when they were of age. Pushed onto each other, they are both very fond of each other, but continually bickering. The young woman, Rosa Bud, is also pursued by a young man recently arrived from India, whose twin sister becomes her close friend, and the uncle and guardian of her affianced, who frightens her. Following the couples decision to part ways, the young man, Edwin Drood of the title, goes missing, and whilst Rosa’s suspicion falls on the Uncle, popular opinion is that the young man from India is responsible. Dickens does have a tendency to be dark, but this book is particularly bleak and parodies church and philanthropy, and pokes holes in the way in which justice is reached by popular opinion. It’s ranges from scenes of opium eating to poverty to dark, evil tempers of strange men, but is lightened by the honesty and integrity of good men and the sweetness of Rosa Bud. Read It If: you are a fan of Victorian literature, Dickens or love a mystery or oddity this will please.